Yummo! | My Cup Runneth Over ... and So Does My To Do List! My Cup Runneth Over … and So Does My To Do List! I used my dehydrator for the first time today! 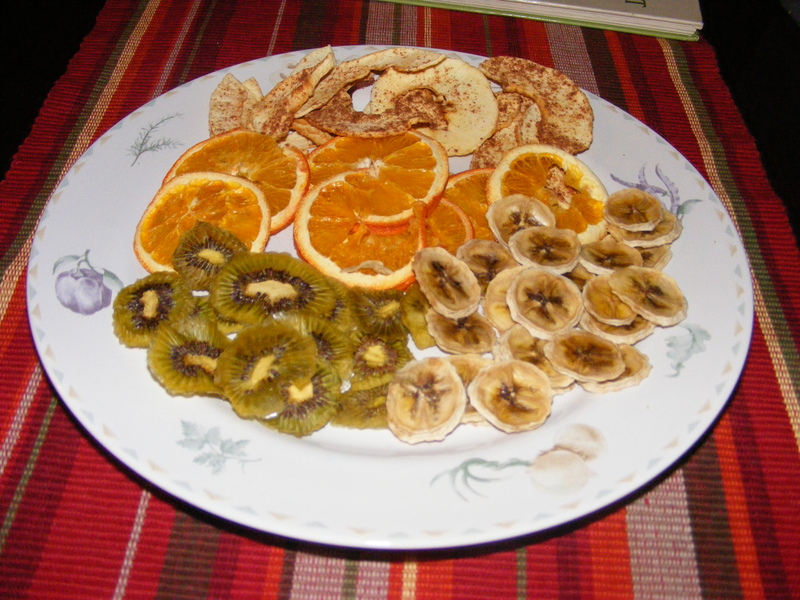 My first experiments foods that I dehydrated are bananas, apples with cinnamon, kiwi, oranges, pineapple, and peaches. I tried a variety to get an idea of what we liked most, and now I know what to make a lot of. The results? Apples with cinnamon are loved across the board! The kiwis were tart and liked by most, but not by all. The bananas are my least favorite, but loved by hubby and all the children, so I will be sure to make more of them. The oranges are disliked by most, but I will make more of them to have on hand to use with herbal teas. The peaches and pineapples are still on the dehydrator because they aren’t quite ready yet. However, we all got a little taste of each anyway, and we know that we are going to love both! The children were requesting that I make more pineapple already, so I will be putting more on tonight this morning before I fall into bed. Here is a visual of some of the goodies that are ready to be consumed….and most of it has already been! !